Steele was the guitarist for Parrotox, Slash and The Whorelords before joining The Misfits in 1978. While with The Misfits, he performed on the Horror Business, Night of the Living Dead and 3 Hits From Hell EPs and his playing can also be heard on the Beware and Halloween EPs as well as the “missing” Misfits album 12 Hits From Hell. 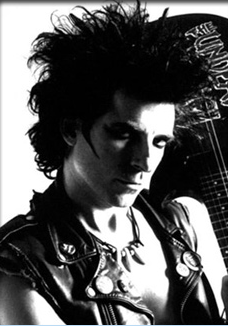 After being replaced in October 1980 by Jerry Only‘s younger brother Doyle Wolfgang von Frankenstein. Steele formed The Undead with Chris Natz and Patrick Blanck. The band released their debut EP, 9 Toes Later, in 1982, which Glenn Danzig helped finance. The Undead have undergone many personnel changes throughout the years and today, Steele is the only remaining original member and chief songwriter of the band. He has also played with Sloppy Seconds, Times Square, The Migraines, and The Graveyard School, and appeared in several movies.